Mariners Planet pay honor to all the Sea farers and their families on the occasion of Sea Sunday. Sea Sunday is celebrated every year on second Sunday of July which falls on 8th July this year. This day is especially celebrated for the Seafarers. The duties they perform for all of us, staying away from their families for long period only to serve their country and its people. People from various places get together at one church and pray for them and their families on this day. 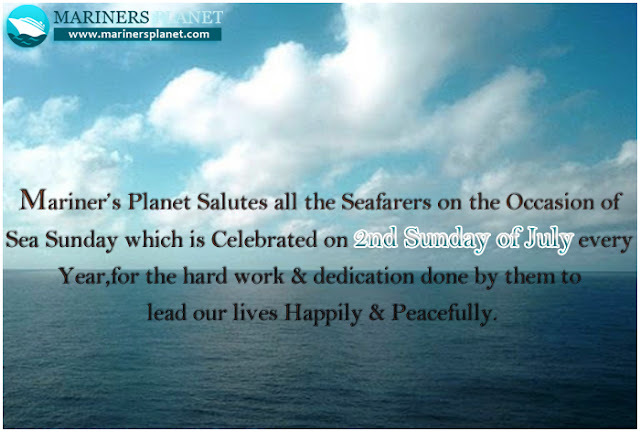 Mariner’s planet a shipping company salutes all the seafarers on the occasion of Sea Sunday................!